Students will learn about various gold rushes, including the California, Colorado, and Alaska Gold Rushes. Students will understand of the major events surrounding the California, Colorado, and Alaska Gold Rushes. Students will understand the impact of the Gold Rushes on western expansion in the U.S.
Students will understand many important issues surrounding U.S. territorial expansion. Students read about of the California, Colorado, and Alaska Gold Rushes using either their textbooks or the information provided here. Students complete the chart comparing the three Gold Rushes. Students work in small groups to conduct further research on one of the three Gold Rushes and create a report and visual aid to demonstrate their research. 1 class period for reading, discussion, and completion of chart. The report and visual aid will require another 3-5 class periods. Gold is a precious metal which has been used for thousands of years as a source of currency and wealth. Although a frenzy accompanied each of the three Gold Rushes discussed here, they did much to open up Western territories to settlement and development. As prospectors hurried to find gold, they created a need for more goods and services in the West, causing many others to follow their lead and leading to the rapid development of many regions of the country. 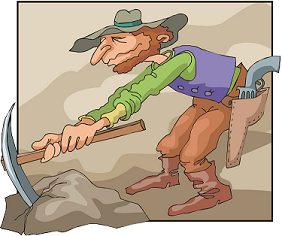 The prospectors endured many hardships along the way. The Gold Rushes caused changes to the geography of the regions they took place in and affected the Native American populations already present on the lands. Gold was first discovered in Northern California, very close to the city of San Francisco. The actual location of the discovery was Sutter’s Mill at a place where the American and Sacramento Rivers come together near the Sierra Nevada mountain range. James Marshall, who had been hired by John Sutter to build a sawmill on his land, was the first to find a golden nugget on January 28, 1848. After testing it, he learned that it was indeed real gold. Although he only told a few people because he wanted to keep his finding a secret, this was not to be. Throughout 1848 the news spread, at first locally, and then throughout the state, the country, and the world. The news started a frenzy in which people madly rushed to California to search for gold and instant wealth. Throughout 1849, people came from all over to search for gold, often traveling thousands of miles and facing terrible hardships along the way. The “49ers,” as they were called, came by land and by sea; both U.S. citizens and immigrants came in search of wealth and opportunity. By the time that the majority of the prospectors had arrived, however, they found that most of the gold had already been taken. Students will learn to write and evaluate expressions that have different money amounts. Students will write expressions with different money amounts in them. Students will evaluate those expressions. This expression means that we are multiplying 12 times an unknown number. This expression could describe a situation involving money. Here is an example. In this lesson students practice filling out a sample car loan application. Students should first search advertisements for a car that they are interested in purchasing. Next, fill out the car loan application form. Students will be able to explain what a botanist is and what kinds of activities a botanist might do. Students will be able to describe five sub-specialties in the field of botany. Students will be able to name places where a botanist might work. Students will be able to explain how a person can become a botanist. Botany is the study of plants. A scientist that works with plants is known as a botanist. Botanists do many different things in a wide variety of settings. They study plants to find out how they can best be grown and thrive. They study properties of plants that make them useful as medicine, and they do research to learn about the nutritional value of plants as well. Botanists also develop ways to use plants to make things like building supplies and fibers for clothing. Botanists may work indoors or outdoors, depending on the specific job they do. They work with farmers, in nature museums and in laboratories. Many work in colleges and universities, where they teach and do research. Government organizations hire botanists as well. For example, the U.S. Department of Agriculture and the National Parks Service are two large employers of botanists. Drug companies, paper and lumber companies, food companies and seed companies also hire botanists. In this lesson students and consumers are provided with a general overview and awareness of privacy issues that impact their lives. In today’s information age, keeping your personal financial information private can be challenging. What you put on an application for a loan, your payment history, where you make purchases, and your account balances are but a few of the financial records that can be sold to third parties and other organizations. This lesson will discuss how public and private records are accessed and used by various organizations, as well as review privacy laws to protect your information. Direct mail, credit reports, telecommunications, and Social Security numbers will be considered from the standpoint of what consumers can do to protect their privacy rights. In addition, students will learn about their options as a consumer and ways to “opt out” of database profiles. Students will also learn about privacy in the workplace and the various issues related to their personnel files, electronic mail monitoring, and laws to protect their rights. In this lesson students will become aware of the warning signs of financial difficulties. The material in this lesson will help students become aware of the warning signs of financial difficulties. When difficulties arise, students should first contact their creditors. Next, efforts should be made to revise spending patterns. In addition, assistance from a member of the National Foundation for Consumer Credit service agencies might be considered. What if these actions do not help? In the next sections of the lesson, students will examine other actions that might be considered, such as debt consolidation loans and bankruptcy. Students should also be aware of fair debt collection practices and wage garnishment. In this lesson students combine decision-making methods with comparative shopping techniques, recognize common consumer scams, and provide the knowledge and skills necessary to effectively handle consumer complaints. Decisions, decisions. With so many choices available to us, how can we be sure we’re making the right decision? Wise consumer buying starts with a plan. Using a systematic purchasing strategy will provide students with an ability to make more effective purchases. Comparative shopping techniques will be discussed to encourage students to carefully consider price, product attributes, warranties, and store policies. Next, this lesson covers a variety of buying methods, such as buying clubs, shopping by phone, catalogs, online, and door-to-door selling. Consumer buying makes a person a target for various consumer scams. While fraud in the marketplace is not new, the methods used have kept up with technology. Telemarketing fraud and deceptive internet promotions result in consumers losing billions of dollars each year. What actions should a person take to resolve a consumer problem? This question is answered with several suggestions in the next section of this lesson. Finally, students will learn about sources of help available to them through government agencies and other organizations.